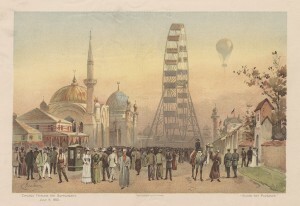 Look closely at the foreground, middleground, and background of this print. What do you see in each area? What kind of place is this? What do you see that makes you think that? What words does this scene make you think of? What details in the image brought those words to mind? The tractor, windmill, and open land might be clues that the place shown here is a farm. But where are the people, crops, and animals? The shovel in the middleground and the earth it sticks out of are important parts of the story. Swirling winds of giant dust storms created the mounds of dry, sandy dirt that make the land in this print look like the bottom of the ocean or a great desert. The tractor and fence look like they might be buried forever by the dust. The two partially covered tree stumps sticking out might even remind you of a shipwreck. The dust storms that destroyed the land took place on the American Great Plains during the 1930s after seasons of too little rain and poor farming practices that weakened the soil. Sections of Oklahoma, Texas, New Mexico, Colorado, and Kansas experienced the worst of these conditions. This region and period became known as the Dust Bowl. During the Dust Bowl, some places, like Kansas and Oklahoma, had little to no rain for up to 10 years. Can you imagine life without rain for 10 years? No one was prepared for the violent winds that blew away the dry topsoil, and left only hard red clay that was impossible to farm. With no topsoil and no rain, nothing would grow in the land. The drought and dust storms happened at a time when farmers were already suffering from the Great Depression in the 1930s. When the stock market crashed in 1929, the prices for farmers’ crops dropped so much that farmers made very little money and were unable to take care of their land. Families were forced to abandon their farms and migrate to new areas in search of better possibilities for work. Many left for more promising agricultural areas, such as California, and others simply went to the next town over. Over the course of 10 years, thousands of people lost their homes and their farmland. 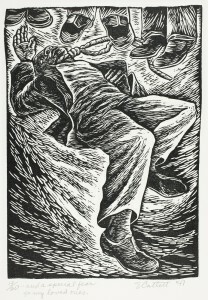 This print by artist Mervin Jules tells the story of one of these sad farmers, who was defeated by the dust and drought and could not continue to farm. The single discarded shovel in the middle of the image suggests that the farmer tried to dig the land, but gave up and left the farm without bothering to put it away. The shovel is small compared with the mountain of dust that needs to be removed. The tractor sitting unused in the yard represents the hopelessness of a farmer who can no longer plow the fields. The tilted and broken windmill and house with missing windows are reminders that the once working and lively farm has been abandoned for a long time. How does Mervin Jules use artistic techniques (craft and structure) to tell the story of this farm? Does the fact that most of what we see is the ground and land in the distance affect the message of the image? How so? How and where does Mervin Jules use contrasting dark and light tones in the print? How do the areas of dark and light help to tell the story? 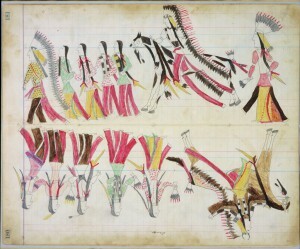 Notice how and where the artist uses lines, patterns and texture. What role do these elements play in this image? How do they contribute to the story? Where do you as the viewer seem to be within this scene? How does that vantage point affect you and relate to the message? 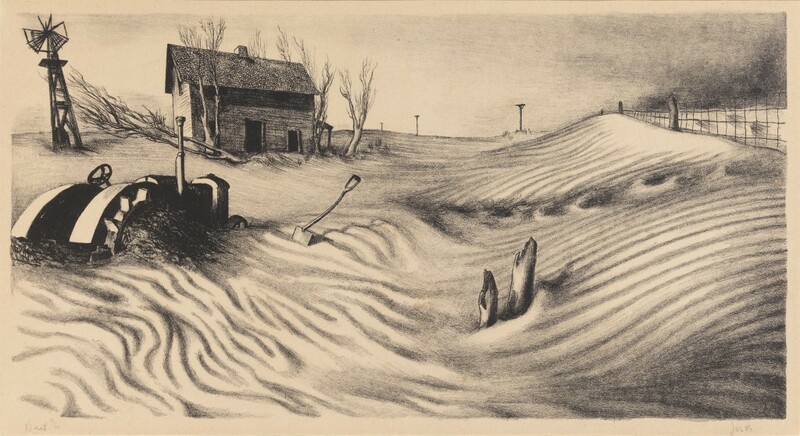 In what ways does this work of art relate to the title, Dust, or to the Dust Bowl? 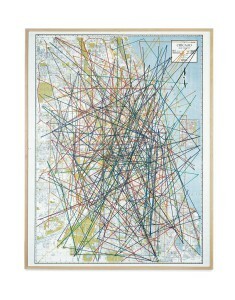 Based on what you have learned about the Dust Bowl, what other titles would you give this work of art?